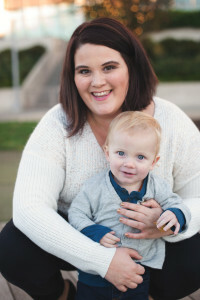 I’m Sarah Campbell, doula and childbirth educator with Mother Rising Childbirth Services. Lindsay and Neil took my private birthing class before they hired me as their doula. This is the story of the birth of their sweet Edith. The weekend before Edith’s birth, Lindsay had been on my mind. I had double checked my doula bag (the bag of “tricks” I bring to births) and made sure I was stocked on essential oils. Lindsay and Neil had run an online survey asking what day friends thought their baby would be born, and I had guessed Sunday, July 8th. So on Sunday, I kept my fingers crossed and sent Lindsay lots of labor vibes. To my delight, as the evening came to an end, I received a message from Lindsay saying she thought she might be in early labor. She let me know that her contractions seemed to be coming consistently every 5-6 minutes. I advised her to rest (sleep, if possible) and eat and drink. Labor is unpredictable and I wanted her to fuel up and rest in case she had still a day or more to go. As soon as I hear a mom is in labor, even when it’s not time for me to leave, my adrenaline starts pumping. I took a shower and packed my doula bag and made sure my kids had easy prep food for the next day with Dad. I let Lindsay know that I was going to try to get some sleep and to text or call if anything changed. At 1:30 am Monday, Neil texted me saying that Lindsay’s contractions had become more intense and they were 4 ½ -5 min apart. I asked how she was doing, if she needed extra support. They responded saying that she was doing okay and just wanted to give me a heads up. I tried to go back to sleep but slept very lightly knowing the call would come at any time. Lindsay and Neil had said that they really wanted their birth to be the two of them as much as possible and it was nice to hear that they were laboring well together in the privacy of their home. As I lay in bed trying to sleep, I thought back to our last prenatal appointment together. 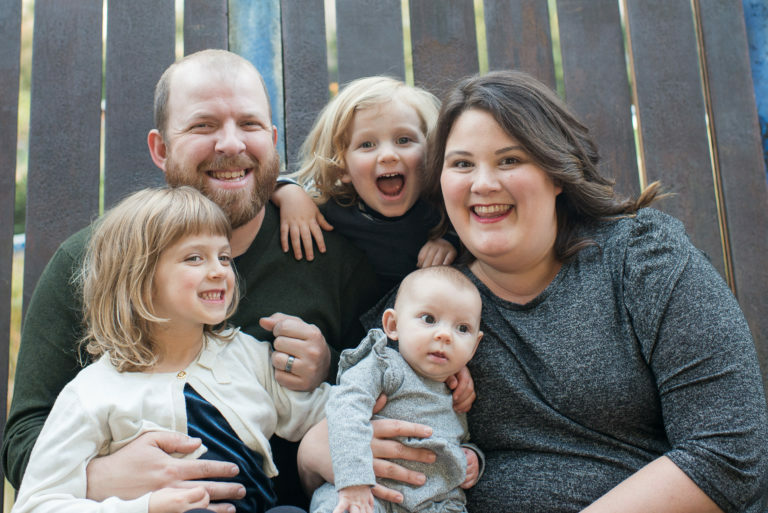 We chatted about parenting, attachment and last minute birth details. I felt a strong connection with the both of them and had a sense that they would be fantastic parents. The honesty and love they had put into preparing for their daughter was evident and I just had a wonderful feeling that their birth would be beautiful. Around 3:00 am, Neil called and said they were hoping I could come over. Lindsay’s contractions were anywhere from 3 1/2 -4 minutes apart. I tried to get a sense from him of how intense the contractions were and thought that maybe we should head to the birthing center instead since it was 75 minutes away. I knew that I wanted to get to their house as soon as possible to evaluate how she was doing, so I nursed my daughter and headed over within 10 minutes. As soon as I drove out of the driveway Neil called back and said they were heading to the birth center. The morning was crisp and calm and there was no one on the roads. I opened my windows and drank in the fresh air, trying to clear my mind so I could support Lindsay free of distraction. I arrived at Gifford Birthing Center just after 4:30 am and found Lindsay and Neil in a room working through the rushes while being monitored with the external fetal monitor. Lindsay breathed through each contraction and her discomfort in the bed seemed palpable. Both her and Neil both were excited and happy however we were all a little anxious to get into the larger, more comfortable birthing room. 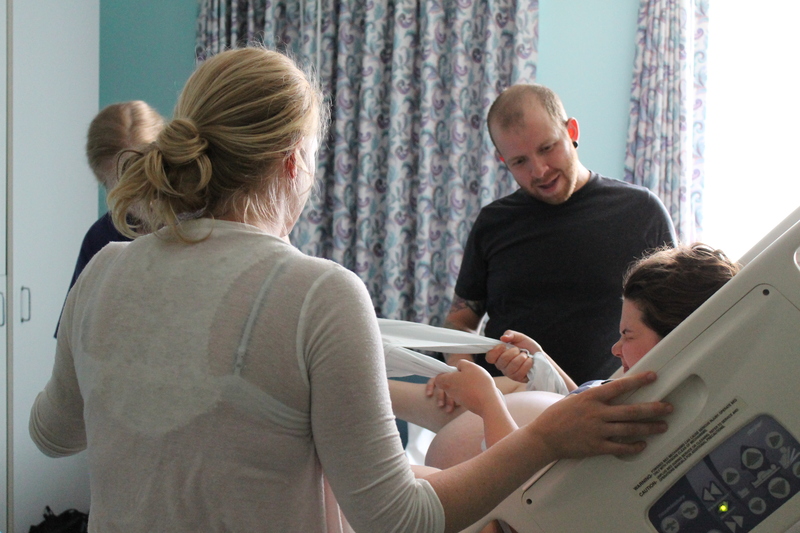 As I was giving Lindsay a short hand massage, the nurse let us know that she could be moved into the birthing room and that she would be able to move freely even though the monitors needed to stay on a bit longer. (They needed to see a significant changes in the heartrate before they took off the monitors). The nurse midwife checked Lindsay and let her know that baby’s head was very low and she was 4-5 cm and 80+% effaced- she had already done a LOT of work at home! She also talked with Lindsay about trying to use these early active labor contractions to rest before the intense pressures came from transition. Lindsay took that advice immediately and focused on calming her body through each one. We settled Lindsay into the birthing room and the nurse got her comfortable on the bed sitting straight up. Lindsay felt that this was the most comfortable position for her while on the monitor. In the meantime, I felt anxious to that Lindsay should eat and was counting down the minutes till breakfast was served. I put some lavender essential oil in a water bath and Neil turned on music. The room felt warm and peaceful. Lindsay looked so serene with the sun peaking through the window onto her face and the birthing bed. She focused and used low tone vocalizations through each contractions- sometimes smiling at the end. Lindsay was taken off the monitor. She stood up, favoring leaning over the bed and swaying her hips, a perfect labor dance to help the baby descend. Without the monitors and extra staff in the room, Lindsay and Neil seemed better able to focus into each contraction and make each other laugh. Neil and I used the rebozo (a long scarf) to squeeze Lindsay’s hips together to relieve some pressure as well as back counter pressure. The nurse gave us a birthing ball and breakfast finally arrived! Lindsay and Neil ate and I could see the nourishment pick her energy up. 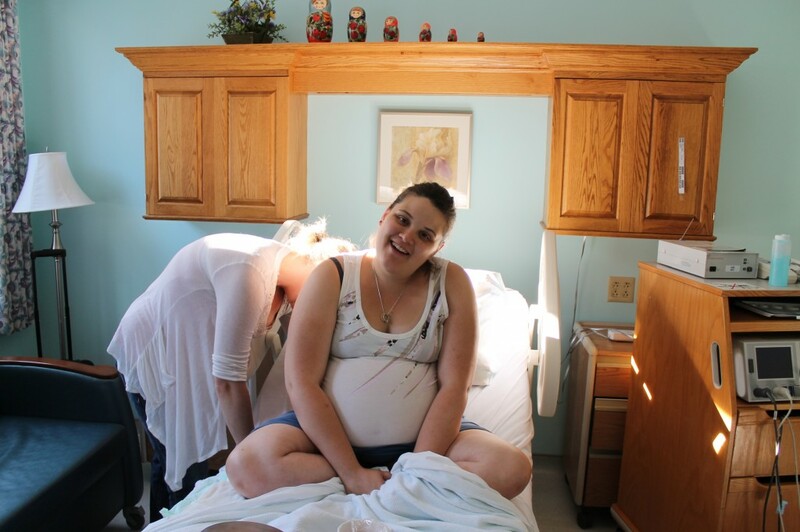 The mood in the room was light and happy even as Lindsay’s contractions were intensifying. Lindsay and Neil even took the time to give me a lovely gift for attending their birth- so sweet! During births, I often take notes about what time events happened, but to be honest, I avoid looking at the clock and typically try to focus solely on the mood, physical state and sounds of the mother. This helps me to know best where she is at and what she needs from me. Even cervical dilation is a number that I note but that’s about it- it tells me little as every labor varies enormously. Much of the time Lindsay did instinctively the exact right thing during contractions. She breathed deeply, swayed her hips and let out low tone moans . Neil and I reminded her to relax her shoulders and soften her body around the intensity of the contractions. Whenever she would start to lose focus, she was able to regain control of her breathing with only minimal verbal reminders. Lindsay’s water broke and labor intensified. She tried sitting on the birthing ball but after a couple contractions, I could see that she was becoming increasingly more uncomfortable and needed another place to find her rhythm. I suggested either the birthing tub or the shower. Since Lindsay really enjoyed being upright and moving, she opted for the shower. Neil and Lindsay were laboring well together so I gave them privacy while she labored there. Meconium was present in Lindsay’s amniotic fluid which isn’t uncommon and while she would have been allowed to labor in the birthing tub,, she wouldn’t have been able to birth there. The midwives and I commented on how well they were doing and how they made such a great team. The Gifford midwives were relaxed and calm and allowed Lindsay to have her birth space- I appreciated their sitting-on-hands approach to the birth. I popped into the bathroom a couple of times to reassure them both that she was doing great. Lindsay swayed over the bar under the hot water, vocalizing through each contraction while Neil, grinning, rubbed her back. Lindsay’s contractions were now on top of each other but even as she would hit Neil’s hand away at the slightest wrong touch, it seemed like each contraction brought the two of them closer together. The intensity of the hot water seemed to start to intensify the emotion with the contraction and I felt Lindsay might need a change. Ellen, the midwife, suggested that she come out and be checked. She was 7 cm but with a very, very soft cervix and Ellen felt that Lindsay was probably a bit more dilated when the baby’s head pressed on the cervix in an upright position. Lindsay labored with arms around Neil’s neck and then found a comfortable position on the birthing ball. Gripping Neil’s hands through each contraction, she managed to laugh and stay light and positive even through the most difficult time of labor. I applied counterpressure to her back and light massage while the midwives and nurses monitored the baby intermittently. I reminded Lindsay that each one brought her closer to her baby. I encouraged her to let go of any tension she was feeling; to cry if she needed to cry. Lindsay would cry out during the peak of each one asking why it wouldn’t end. We would remind her to breathe and she would completely refocus and breathe well, using “horse lips” which relax the perineum. Although she coped beautifully, she felt pretty fed up with the constant contractions and just clung to Neil’s hands for support. I could feel the short bouts of desperation and it brought me back to my own birth experiences. I tried to focus completely on her emotion and put my positive energy into her back with massage and pressure. I tried to keep her voice low by saying a low “outtt” with her and reminding her to soften her body around the intensity. Soon enough, Lindsay felt pressure. She wasn’t ending her contractions with the typical grunts that signal pushiness so I asked her to describe the pressure. She felt it rectally like the feeling of a bowel movement. The nurse and I both felt pretty confident that she was probably ready to push. Ellen checked her and she was 10 cm and 100%. We just encouraged her to do whatever her body wanted her to do, push or rest. Lindsay decided to get into the squatting position on the bed and use the squatting bar for support She pushed almost silently and focused completely. Each push was effective and strong. 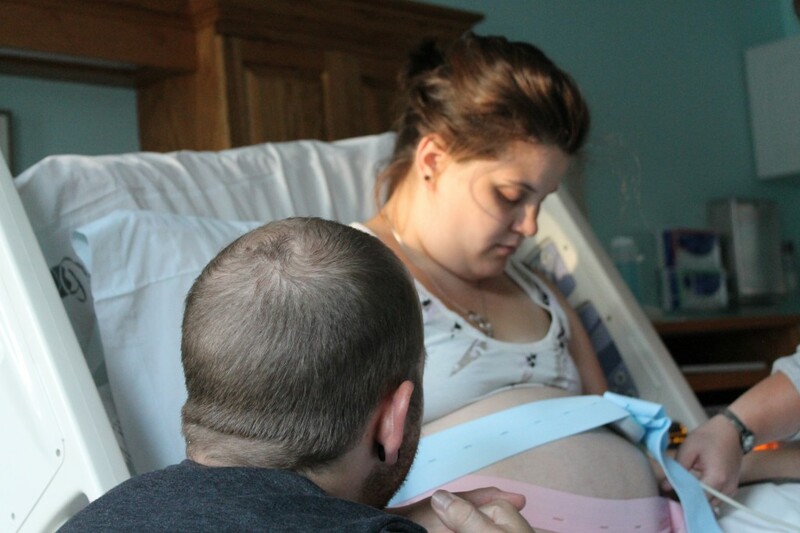 Lindsay turned inward completely and used all of her strength to get through this stage of labor. Neil and I kept her hydrated with juice and water and kept cool washcloths available for her face and neck. The midwives had Lindsay try a couple of different positions for pushing. She ended up feeling most comfortable in a reclined squat – using a sheet wrapped around the squatting bar for support during each push. I reminded her to curl around her baby and focus her energy down to her core. She truly didn’t need much direction and pushed effectively even as she started to tire. As she neared the end of pushing- near crowning- we could see her energy fade. We tried to tell her of the progress she was making but we all sensed she just wanted the baby out. With each push, she came a tiny bit closer to meeting her daughter. Neil’s excitement started to grow when he could visibly see baby Edith’s little head coming closer to crowning. At last, Edith started to crown and Lindsay’s energy picked up. She was motivated now and wanted her baby in her arms. The pediatrician and another doctor entered the room for the last few pushes as a precaution because of the meconium in the fluid. A last few triumphant pushes and Edith was born. I tried to take photos of each second as best as I could. Lindsay and Neil gaped at their new baby and were so in love. We had asked everyone not to tell the gender out loud so Neil could announce it. Neil excitedly announced to the room it was a girl!!! The baby was brought to the warmer and the pediatrician calmly looked her over and told Lindsay how perfect she was. He quickly returned her to mama and the nurse put her skin to skin while the midwives took care of the third stage (placenta delivery, etc). Baby Edith gazed her mommy and daddy. She even cooed and seemed to smile at Lindsay. She was content to be snuggled up warm against her mama. She needed a little suctioning and blew lots of bubbles in the first few minutes. Things settled down pretty quickly and the midwives left Lindsay and Neil to get to know their new baby. We introduced Edie to nursing and she knew just what she was there for. Edie latched nicely after a couple of attempts. Once momma and baby were settled with nursing, I tried to clean things up and make sure food was on the way for everyone. After a short while, everyone was ready for some family time and I said goodbye to a happy family of three! The Gifford nurses and midwives were such awesome people to work with and I loved knowing that they had the family’s best interests in mind for their stay there. Lindsay and Neil decided to encapsulate their placenta so I agreed to drop it off to the placenta encapsulation specialist. On my drive back to Burlington, I thought about how lovely their birth was and how excited I was to show my 3 yr old son a photo of Edie (he always asks to see the baby). 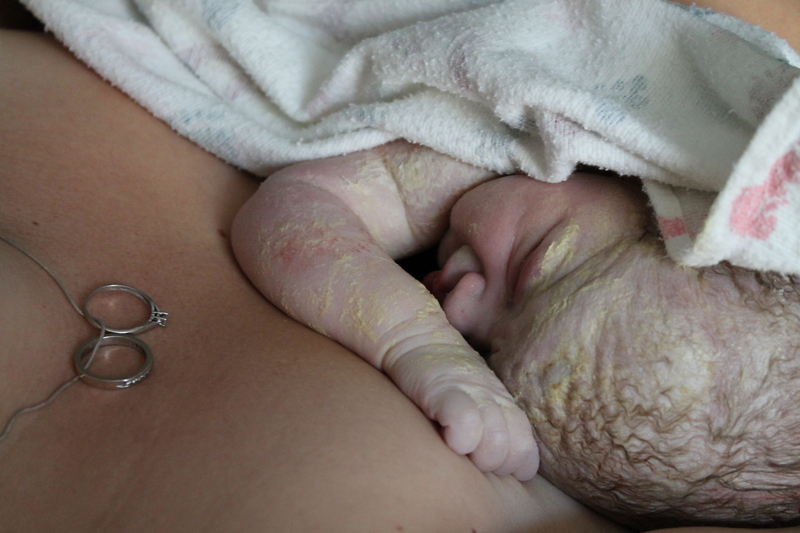 Lindsay was a perfect example of how beautiful birth can be when you trust your body and listen to your instincts. Neil & Lindsay labored together and their love was tangible and evident throughout the whole experience. I feel so privileged and honored that they invited me to support them and am looking forward to seeing their lovely Edie grow! Your birth experience sounds so lovely! What an amazing doula, and an amazing family. Beautiful! What an incredibly touching story. I was moved. 🙂 You guys did a great job and your daughter is beautiful! !